A big thank you to everyone who took the time to enter the NihongoUp giveaway contest I have been hosting for the past 2 weeks. There were 22 entries overall in the form of 16 tweets, 5 blog posts and 1 image. Sadly there were no video entries so that extra copy of NihongoUp will be added to the Twitter entry pool. So there will be 1 image winner, 1 blog post winner, 2 twitter winners and 1 winner that I will choose as my favourite entry from the entire pool. The first winner is Will! He increased his chances of winning by entering via blog post and image. It paid off because being the only image entry he is an automatic winner, I wouldn’t say he had an easy win, he just wanted a copy of NihongoUp more, after all he is Heading for Japan. The second winner is Austin! Another winner who increased his chances by entering multiple times via a tweet and blog post. His blog entry was luckier that the other entries and he will be rewarded with a copy of NihongoUp for his efforts, congrats Austin from Austin Otaku. As expected Twitter was the most popular way to enter the contest and out of the 16 entries Jason (matigo) and Mary (maryag) are the randomly chosen winners plucked from the Twitter pool. Multiple entries paid off again as Mary’s blog post wasn’t lucky but her tweet sure was. 4 winners were randomly chosen above but alas if you were not lucky enough there was still a chance to be my super biased automatic winner by bribing me or knocking me off my computer chair with an amazing entry. Unfortunately no one thought of buying me that F-22 I’ve always wanted or even that plantinum Gundam. My favourite entry came from Dendoo whose swamp water perfume was the reason I fell off my chair, when I recovered she proceeded to play on my emotions with her tales of wanting lose her virginity by being a mail order bride sent to Japan. Congrats Dendoo-chan, remember the deal was you’ll cut me into small peices, smuggle me into Japan then put me back together with the help of your brother. Read her blog post here. Winners will be contacted within the next couple days and receive there free license for NihongoUp. If it was up to me everyone who entered would be winners but unfortunately everyone couldn’t win. Big thank you to Phillip who is the creator of NihongoUp and to everyone for entering. 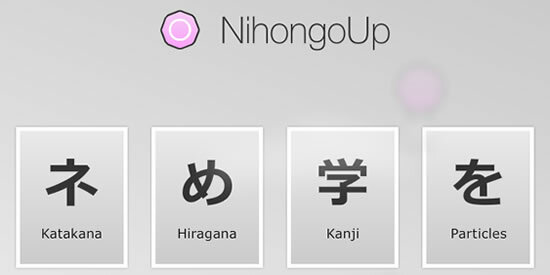 Read my review of NihongoUp and good luck studying Japanese! Woohoo! Thank you, kind sir. I never win anything, so this is a great Sunday morning surprise. Thanks for having an awesome contest. I look forward to using Nihongoup! AustinOtaku has it right, a good Sunday Morning surprise. CONGRATS to all the winners and great job to everyone who entered! Glad it was a good contest! I’ve never won anything before with the exception of a lifetime supply of air when I was born. So this is how it feels to be in the winner’s circle huh. Well I informed my bro that he has to help put you back together again and he asked if you really want that. I mean…he helped glue me back together again and now I end up smelling like swamp water. If you’re willing to take your chances then chop chop! Congrats to the other winners! Ari-freaaaaaking-gato!!!!!! Wow … I take the weekend off from the computer to come back and see this! Thanks, fine sir! Hey! I missed the contest! ooh well, maybe I’ll have another contest to give away another Japanese related price in the future ;) stay tuned!